The light emitters and receivers are housed in individual, spatially separated housings that must be installed opposite one another and aligned. Extremely long sensing ranges and high signal strengths can be achieved with thru-beam sensors because the light emitted from the emitter reaches the receiver directly. These sensors detect the smallest changes in the intensity of incident light and are able to detect glass and other transparent objects reliably. Switching threshold adjustment compensates for any dirt on the sensor lens to prevent extreme sensitivity from causing malfunctions. Retroreflective sensors, which have emitters and receivers in the same housing, are easy to install and align and require a reflector. The reflector reflects the light emitted by the emitter back to the sensor so that the receiver detects it. If the background and objects are reflective, polarization filters guarantee reliable operation. These photoelectric sensors do not respond to signals from reflectors and high-gloss reflective objects positioned closer to the sensor than the preset minimum sensing range and therefore ignore anything in the close range. They are suitable for recognizing objects wrapped in shrink wrap, for example. Light emitter and receiver incorporated in a single housing. A reflector is not required because the detected object also functions as a reflector. The sensing range referred to here as the detection range is reduced due to the diffuse object reflection. The main strength of diffuse sensors is the detection of very small objects at close distance. The visual fields of the emitter and receiver on these special diffuse mode sensors cross over in such a way that only light reflected from objects positioned a certain distance away from the sensor reaches the receiver to prevent interfering objects in the background from causing a malfunction. These sensors are also insensitive to interfering objects in the background. Additionally, they are extremely accurate, their sensing range can be varied more effectively, and they have a more efficient emitted light energy which makes them insensitive to dirty or dusty lenses. 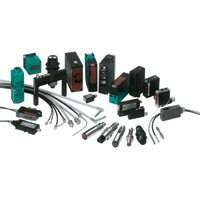 The special feature of this type of sensor is a receiver consisting of two elements. More light falls on the closer element or the further element, depending on how far away the reflecting object is positioned. The sensor indicates the presence of an object only when more than half of the emitted light falls on the closer element. As a result, the sensor detects objects in front of a close background with extreme accuracy regardless of the consistency and color of the object and the background. The same applies for dark objects in front of a light background.